One down... too many to go...: Oh, Starbucks, how you torment me so. Memories are a special thing. They can remind you of both good and bad times. Sometimes, they get suppressed in attempt to make things better... but, that usually doesn't last too long. As I sit here in Starbucks after a long group project meeting discussing FELICA and Bluetooth and Sonar and vacuum tubes (don't even ask), I am reminded of a special time in my life from over a year and a half ago. A time that, although short lived, was one of the best things that ever happened to me. Something I can't stop thinking about. Yes, I've tried suppressing these memories for so long. But what now? Out they flow, like water down Niagara Falls or character development in a Danielle Steel novel. Really. Just like that. 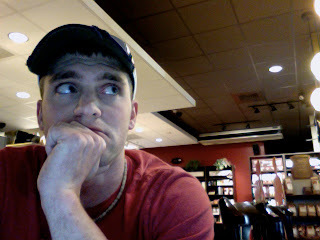 Oh, Starbucks, stop having such good coffee and ambiance. That way, I'll never have to come back... but that's quite unlikely. Sigh.